Didn’t realise quite how much I needed this. My two nights with Thera-Sea were incredible - I left with a far better understanding of the signs of stress (many of which I had no idea about) and how to deal with them. I’ve now been on a couple of Thera-Sea courses and have really enjoyed them both. Whilst I’ve never really considered myself a stressed person, I have been amazed how a few simple techniques have helped to improve my sleep, productivity and general well-being. Being in such amazing locations really allowed the group to relax away from distractions of day to day life. Exciting and educational in equal parts, I found my two days with the Thera-Sea team to be hugely beneficial. The opportunity to step away from technology and back to nature for a couple of days was really rewarding. I don’t consider myself a stressed person, but even I was surprised at how much I benefited from the insight and education of Katy’s excellent course. The natural surroundings had a lasting calming effect on me, and two highlights were the wild swim (with a seal that popped up to say hello!) and the group activities. Also had one of the best nights sleep I can remember in a long time. This is exactly what we all need in this fast paced, modern world. A ‘preventative’ method to stress and anxiety, rather than ‘shutting the gate after the horse has bolted’ and throwing pharmaceuticals at people. The course was informative and relaxed giving insight and links to other avenues. As a serving member of the Fire service and an Ex Royal Marine commando Katie gave me some vital tools for dealing with stress management in the work place as well as at home. The course was held in a very relaxed environment and I was extremely comfortable talking about my stress issues with Katie and the other members of the course. This was all topped off by a fun surf and some amazing grub. I was in desperate need to deal with my stress, at times lost in fear, anxiety and depression. I found Katy very informative, knowledgable and with a vast array of pertinent experience in the field! Katy specialise in tools and action plans with guidance and a practical approach to day to day solutions that work. Stress is all around us on different levels and layers which triggers both conscious and subconscious effects, sometimes the rut runs so deep that i get stuck in it feeling helpless, confused and frustrated. I am already more confident that i can create thoughts and behaviour which will enable me to break free from the rut and the destructive ripple effect stress has on my life. Her passion for stress release through exercise and particular the natural healing element of the sea is very powerful. 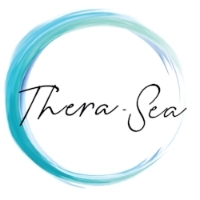 Set in a relaxed and friendly environment my one day masterclass with Thera-sea was most beneficial. Katy is very knowledgable and explained in ways easy to understand about stress, it’s causes and effects, ways of managing stress, the importance of self preservation and the science and biology behind it. All of the information from the course was of great benefit to understanding the reasons for some of my behaviour and how best to manage and prevent it. Through my experience this type of therapy or counselling is not easily accessible and has a long waiting period. I found this a unique and informative experience with a non clinical feel, the food provided was delicious and catered for specific dietary requirements, with facilities and venue equally as good. Katy’s focus on lifestyle medication, I can see being a more permanent long term resolve for me and the realisation of effects of water sports in a natural environment was awakening, opposed to any short term gain from prescription medication.